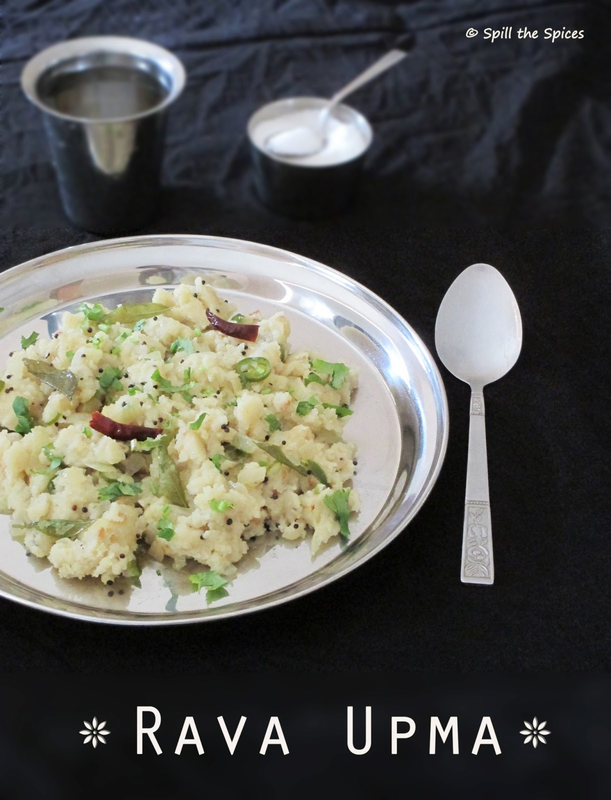 Rava upma is one of the easiest South Indian breakfast dish, which is even cooked for a quick dinner! But many people are not a fan of upma. That included me too till sometime back. Upma should be properly cooked, spiced and tempered, otherwise it would turn to be bland. Upma can also be made with wheat rava and semiya/vermicelli. 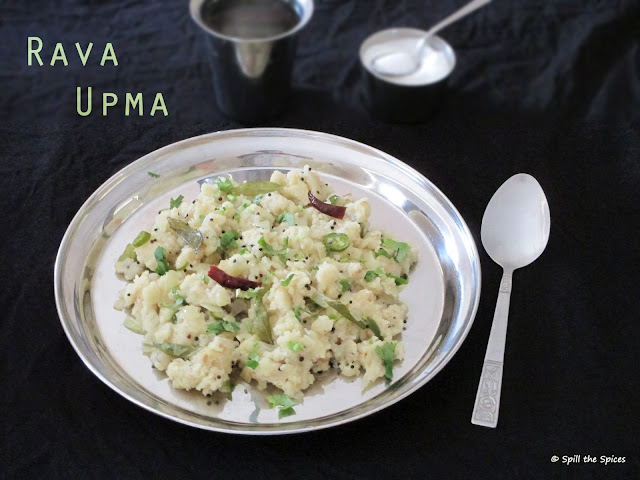 Now a days many other grains like cous cous, quinoa are being used to make upma. One of the main keys to make non-lumpy and non-sticky rava upma is roasting the rava which makes sure that the upma does not become sticky. 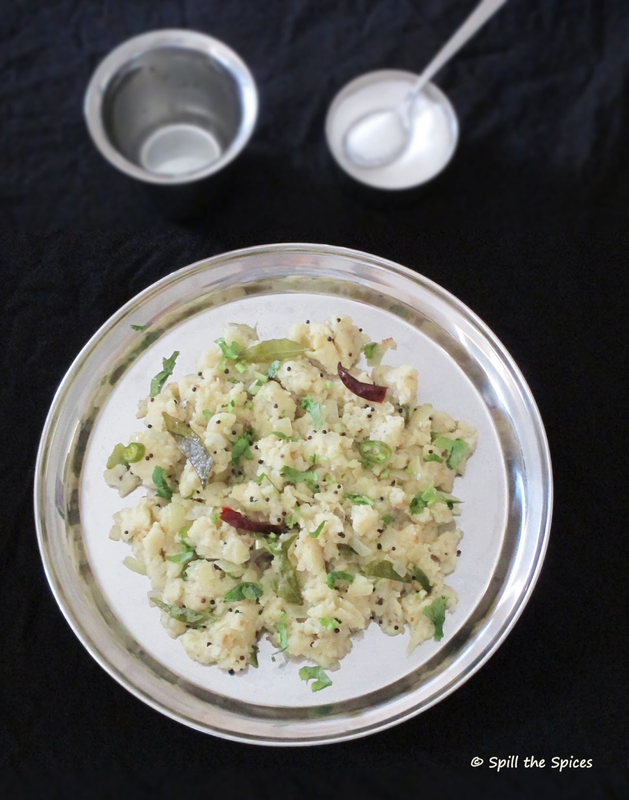 You can relish upma with sugar or a banana. You can also serve with coconut chutney and sambar. I like to have my upma with some sugar, pickle and a cup of hot coffee. 1. Dry roast the rava till its turns lightly brown and set aside. 2. Heat oil and add mustard seeds. When it pops add urad dal, asafoetida and red chillies. Fry till the dal turns golden. 3. Add onions, green chillies, ginger and curry leaves. Fry till onions become soft. 4. Add salt, water and bring to boil. Then reduce the flame to low and slowly add the roasted rava and mix well, making sure there are no lumps. 5. Close and cook in low flame for 5 minutes or till all the water is absorbed. Then add ghee, mix well and stir for another 2-3 minutes. Garnish with coriander leaves. 1. If you want a bit gooey upma, then add 3 cups of water. 2. I add tomatoes at times, which gives a tangy taste to the upma. Alternatively, you can squeeze some lemon at the end. 3. Adding ghee at the end gives a nice flavor to upma. 4. You can also add in some vegetables like peas, carrots, beans etc after frying the onions. 5. You may add some chana dal also while tempering. Upma looks delicious and beautifully presented. like this always.. :) easy and tasty breakfast recipe.. Perfectly made upma! Loved the presentation and pics!